There are a few things you need to find in any new neighbourhood you move in to, well, in my books anyway. 1) a neighbour you trust enough to tell that you are on vacation. 2) bike paths. 3) closest drug store/ late night market 4) now with lil dude, nearest clinic 5) staple takeaway joints: Chinese, Thai, Indian, and pizza. There are concessions D and I make about Takeaway for Chinese that we do not make for the other takeaway or sit down. Bad Thai food is bad Thai food whether or not it comes in a foil container. And bad pizza is easily replaced by freezer pizza. But there is something about takeaway Chinese that we expect to have at home that we wouldn't really if we sat down in a nice Chinese restaurant. Perhaps it's the nostalgia. We grew up in the days that cultural diversity was just in its adolescence. Thus, alot of 'ethnic' foods catered to western palettes and or had to make due with a dearth of authentic ingredients. So perhaps it's not exactly good Chinese food we seek when we order from this lot but the Chinese takeaway from our youth. Now, let me make it abundantly clear. This ilk of Chinese is still MILES AND MILES above the type of Chinese food you would still find in most Malls. Blech. Puffy, doughnut battered chunks of Chicken glazed in some mysterious dayglo red sauce. Awful. Still, what rules do we break when we look for neighbourhood Chinese food? a) more Chinese people eating than western. b) no western or other ethnic foods on the menu i.e. pad thai or french fries. c) dusty plastic plants all over the dining room. d) a cathode ray tube TV prominently perched on the counter. Yeah, you wouldn't catch me looking for a night out there. But here I am at home, exhausted and jonesing for a good chow mein, yeah, I'm picking up the phone. XinYi Garden is one of these places. IT is actually, on the lower end of this range in some aspects because alot of these, though they may make concessions on the menu, still have wicked core Chinese. Sadly, XinYi Garden did not have a wide variety of noodles or veggie dishes which I crave, particularly my preferred Ho Fun or Eggplant (w/o Pork). Still, it had it's highlights. The brightest of which is that it is a 2 minute walk from our new rental. That means we could pick up if we wanted to stretch our legs and get a 10% discount or fully veg out and get it delivered in less than half an hour from hanging up the phone. Come on! Since the menu they keep dropping at our door included a coupon for Egg Fried Rice if I paid cash, I opted for the delivery since we had to order a minimum anyway. In retrospect, it wasn't entirely worth it except to give dad a good dose of Chinese which mom NEVER orders EVER. She's a purist as far as being a home cook. 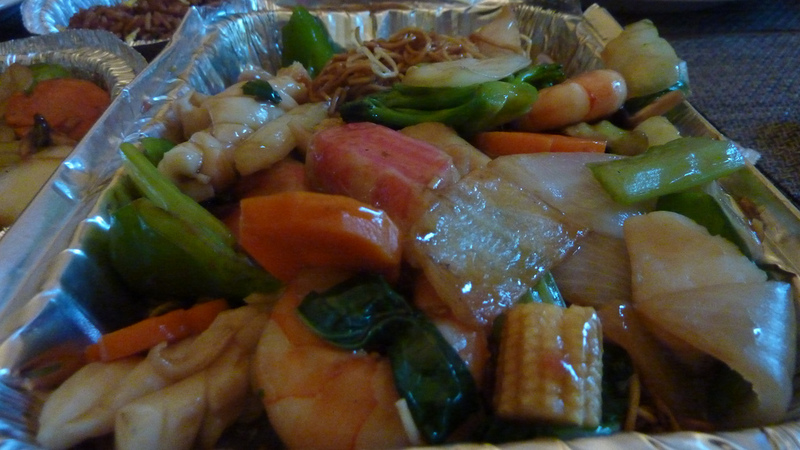 We ordered the Seafood Chow Mein, Szechuan Eggplant with Tofu and Peppers, Kung Pao Shrimp and Egg Fried Rice. It was quite funny. Mom and Dad were over to play with lil dud so Mom was trying to work out how much to tip since they were only coming from up the block. We didn't have the right change and in the end, dude strategically brought enough change to round to the dollar where he knew we likely wouldn't have had the right amount to work out well and got himself a hefty tip. HA! I'm picking up next time. Especially since the Egg Fried Rice was a bit of a disappointment. IT tasted alright as this type of Chinese does but it did not taste made to order. IT also had that aspect of too much soy since every grain of rice was thoroughly tinged dark brown. That aside, since as I said, it tasted alright, there was BARELY any Egg. I guess you get what you don't pay for. I'll do what I normally do and make my own steamed rice next time. The Noodle Dish was quite nice. The noodles were the thin Egg Noodles which are not my favourite but they hit the spot. The sauce was a generic Chinese sauce but there was a good amount of Seafood and Vegetable. The Kung Pao Shrimp was just okay. 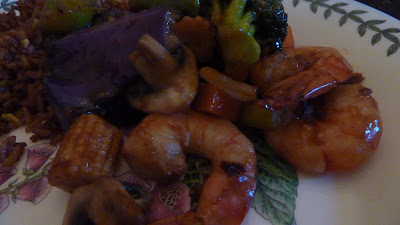 The Shrimp were large and tasty but not as plentiful as other places since there was a lot of 'filler' veg like Carrots and Celery. Normally, when you order a Shrimp dish, unless specified, there are no veg, just a heaping serving of Shrimp. Plus, there was no POW in the Kung Pao. I think I'll have to specify next time. The Eggplant dish was nice except for the scarcity of the actually Eggplant. There were more Peppers and Onion than Eggplant. My favourite Eggplant dish is this very Spicy, slightly sticky Eggplant dish that is nothing but searing hot Eggplant strips. That was what I was hoping for. Waah. That, I'll have to keep looking for. All in all, it was decent. Decent enough that I would try again but probably different dishes except I think I'd have that noodle dish again. I mean really, I laugh at the other reviews on Urbanspoon. You can't seriously order 6$ fried rice from this place and expect Susur Lee as the chef. It is what it is and it's okay for what it is. On the heat side, given the location in the Bloor West, wonder bread community, I'm not surprised that they've played it safe on authenticity on the sauces. I say wonder bread because I'm quite a bit of an anomaly on my block. Sometimes, out with lil dude in his wagon, I feel like I look like his imported nanny :^P. Next to tackle will have to be good takeaway Thai. Goodness help me, I will not order it from the XanYi. No! That's just wrong. In the last few weeks in Vancouver, D and I had been trying to cover alot of gastric ground. This is obviously no small feat with our new small feet (bad baby pun intended). I'll stop now. We don't have baby sitters for our newborn so we've been visiting alot of the places that have been our long standing 'to go to list' or 'need to have one more time list' during the day or on off peak nights like Tuesdays and Wednesdays. We even got a photo with the lil dude and Tojo on one of those excursions :). Well, time was ticking and cousin, H was visiting from Toronto and so I took the opportunity to take her to Ensemble. She offered to let D and I go while she stayed home with the lil dude but D insisted I take H since she came all this way. Truth be told, I hadn't really wanted to go. It was on D's list. I actually had though the Chef/Owner Dale was a bit of a douche on the first season of Top Chef Canada. I had been rooting for Connie. That said, even my good mates K and J who felt the same about him on the show both raved about the food. What can I say? I trust my girls. We booked on Open Table and were pleasantly surprised how empty it was. It was a Sunday I guess, which also meant, the chef wouldn't be there. 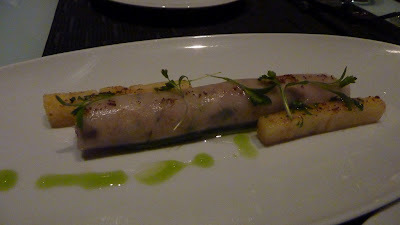 Too bad, I wanted to get a photo for D. The concept is the very popular and too often abused small plates. Why do I say abused? Because the average price of the small plate means they'll be listed on the 'affordable' scale on most sites but the per person price is a more realistic way of rating which is not on that 'affordable' end of the scale particularly the small plates are just that, quite small. Often they are smaller than appetisers. What I also found annoying is that the server here, as they do in similar places, suggest 2 to 3 different dishes each. This is aggravated by the fact that the menu is very limited. If you are in a party of 2-3 people, you will have to order every item on the menu to have that many dishes. There's that Top Chef douche that I so wanted to turn the dial on trying to dictate what I should eat. Dale was always the contestant who took the stance of "this is my food and this is what I do, take it or leave it". Lo and behold, he baked that into his restaurant. As it turns out, if we had done that, we would have been rolling out of there. I always go 1 less they they try to 'sell' you. Yes, J and D, I'm done complaining about Dale now. On to the food. The first dish to come out was the Crab Roll. It was a cigar size rice roll stuffed with Dungeness. It was very fresh, and surprisingly abundant on fresh picked Crab. Downsides? It was a tad bland and I found a big chunk of shell. I nearly chipped a tooth biting into it. I pointed it out to the server who's reservedly disdainful reply was 'Oh.'. Yeah, I carried around a shell just to place it on the plate to complain. I mean come on, at least apologise. I clearly ate the rest of it. H ordered the Black Cod in Pork Thai broth. We had taken her to Sha Lin the night before. 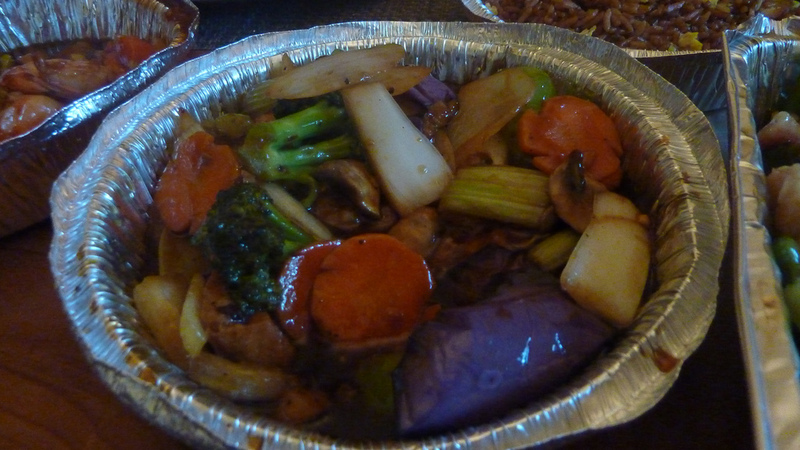 A popular chinese hole in the wall with awesome food. She preferred the similar dish she had at Sha Lin. Actually, she found something about the combination of the spices and that weak, water broth a bit off putting. When the server came by to collect her still rather full bowl, she asked how everything was. H, a very non confrontational person, admitted, quite honestly, it was not very good. The server looked at her puzzled as if there must be something wrong with her hearing or H's mouth. Well, it's one of our most popular dishes, she tried to explain. I did not see how that was relevant to this experience. I am not surprised by her answer though since that item is advertised as a popular dish in the menu. I had a Moroccan Spiced Black Cod. I have to admit it was perfectly cooked. However, it was on the blandside and the dryness of the rub was texturally a tad unpleasant. 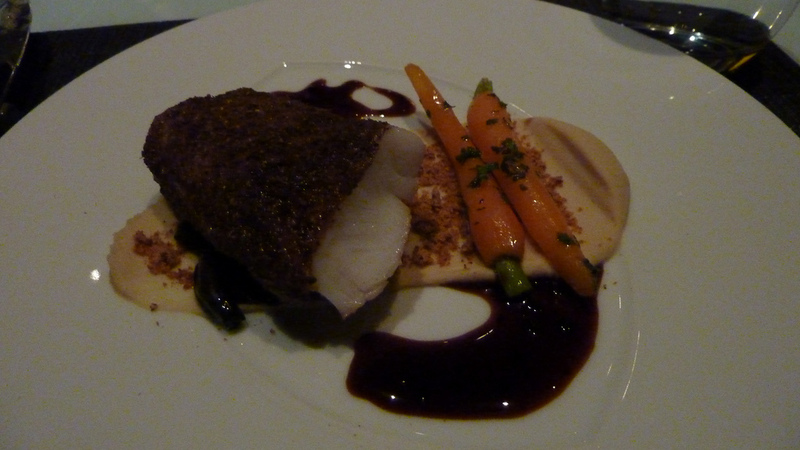 The Hummous was very very bland but the Carrots were well cooked. When I say something is bland, that is something. I tend to find things too salty. Lastly we shared the Curry Mussels with Fries. They were lovely. All the Mussels were perfect as if someone had handpicked the cooked ones. There wasn't a single empty shell in the bowl and we practically drank the broth in the little dutch oven. 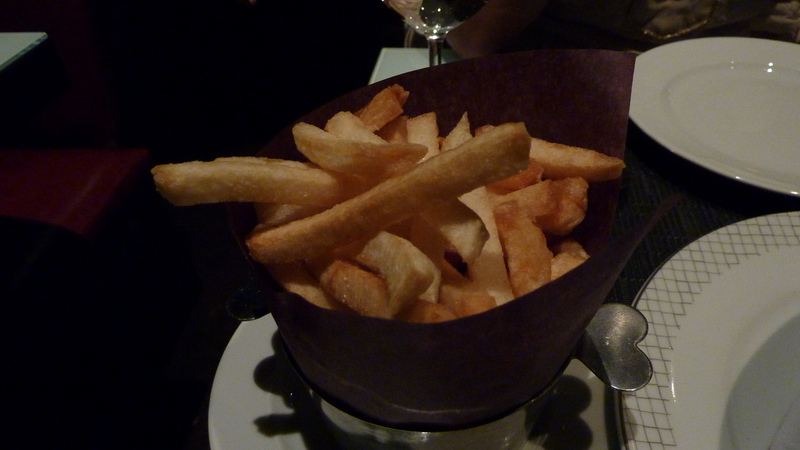 The fries were nice, very crispy but with the big serving of Mussels, we didn't really need them. This was when I was happy we did not order three each. 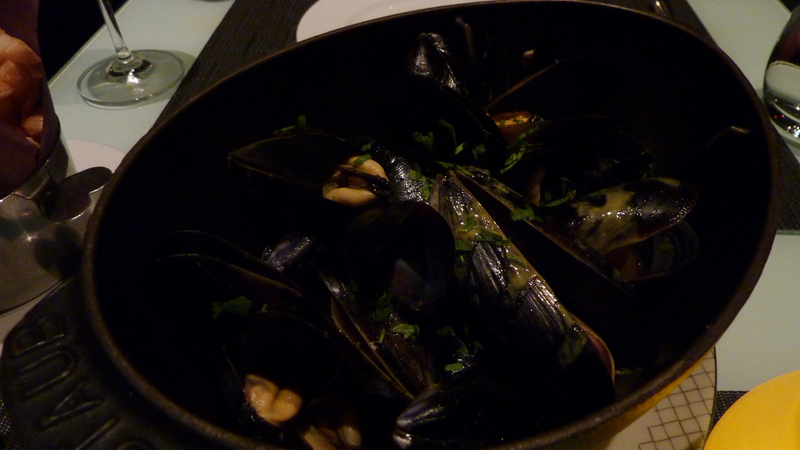 In fact, having ordered the Mussels, we needn't have ordered the 1 extra to share. I would have this again and again. The Fish dish and the Pork Broth, yeah, I would not recommend those to anyone though. I'm not sure I'd be clamouring to go back when I'm back in town. I'd sooner hit Sha Lin, Tojo's or Go Fish if I breezed through. Service: odd. cool, smiley yet not willing to please. Child friendly: Oh gawd no. The place was empty on a Sunday and I would have felt out of place with lil Dude.